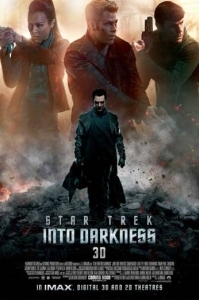 Opening to a heart-racing chase sequence upon a rather volatile, volcanic planet, the tone for J.J. Abrams’ summer sci-fi sequel Star Trek Into Darkness (2013) is ruthlessly and efficiently set from the off. This time around, the crew of the USS Enterprise are able to forgo the rudimentary establishing of back stories, allowing for a more mature offering, yet one still laced with enjoyable quips and boyish fun. Abrams’ command of spectacular CGI set pieces provides the perfect backdrop for Captain James T. Kirk (Chris Pine) and his motley crew, even if the comical overuse of lens flare still proves to be his Achilles’ heel – more so in unnecessary 3D. Following on the thrilling, aforementioned lava-filled opening, Kirk is demoted as captain of the Enterprise after the ever-logical Spock (Zachary Quinto) reports his cocksure superior for breaking Starfleet protocol. Cutting to a futuristic London – all polished steel and spotless glass, peppered with a few notable landmarks – we’re introduced to Sherlock star Benedict Cumberbatch’s John Harrison, who promptly proceeds to blows up a valuable Starfleet archive. So begins a series of attacks upon Earth by Harrison that ultimately leads to Kirk and co. having to hunt the superhuman terrorist across the galaxy, finally taking them to a familiar locale that die-hard Trekkies will no doubt be pleased to revisit. Retaining much of what was so successful about the 2009 reboot, Abrams now has an entire universe at his disposal within which to create more interesting character dynamics – and he does so to great effect. There’s a tremendously enjoyable, snappy performance from Zoe Saldana as Lt. Uhura that sees the Avatar actress further develop her on-screen relationship with Quinto’s Spock. Yet, it’s the continuing bromance between the Vulcan and our well-coiffured Kirk that remains the most compelling. The entire lead cast bounces of each other’s performances, topped off by a suitably antagonistic turn by Cumberbatch – maintaining the proud heritage of British villains in Hollywood blockbusters with aplomb. There are some scenes where you’d be forgiven for questioning whether Abrams has forgotten he’s currently making a Star Trek movie and not the next outing of the Star Wars saga; Simon Pegg’s Scotty seems to be playing a composite mash-up of both C3PO and R2D2 as he bumbles around a juggernaut starship with his dodgy Scottish accent. The greatest strength of In Darkness, however, lies in its subtexts of friendship and loyalty, making this far more than just a throw-away franchise entry. Whilst it arguably lacks the fresh energy of the first outing, Abrams here seems content to make minor tweaks to a winning formula, all the while keeping his sci-fi space opera accessible to all.